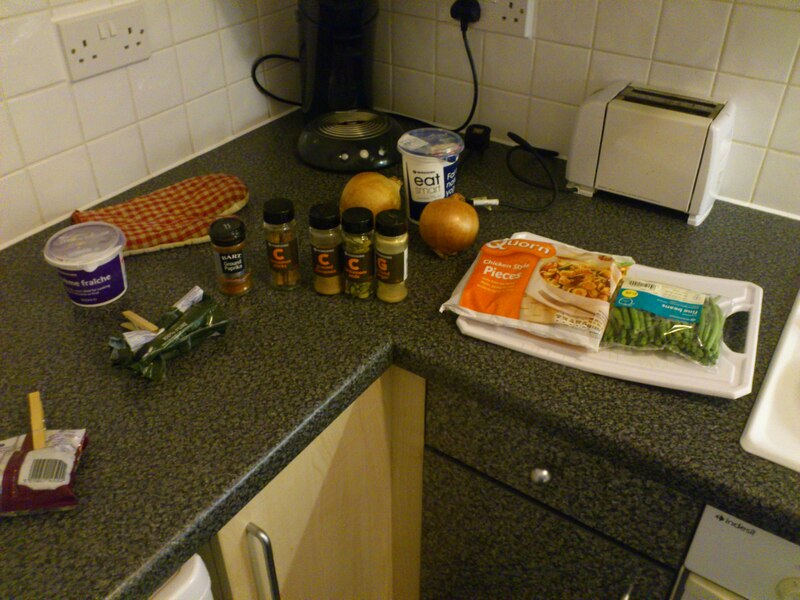 Quick Korma, or how to make a healthy curry in a hurry. People tend to think of Curry as as an unhealthy meal, something which can be stodgy or fatty or overly oily. I think this can be true of a bad take away or a microwave meal which can often be full of sugar, salt and fat. In this case then a curry is often not a good choice, but a ready meal can take 30 minutes to cook in the oven and that’s almost enough time to make a curry yourself. So last week I decided we should have a Curry night but one which is well balanced with not too much fat and without packing it full of Sugar and Salt. Next I had to decide what type of Curry we should have. I really wasn’t sure which I wanted so I turned to the net and our cookery books. 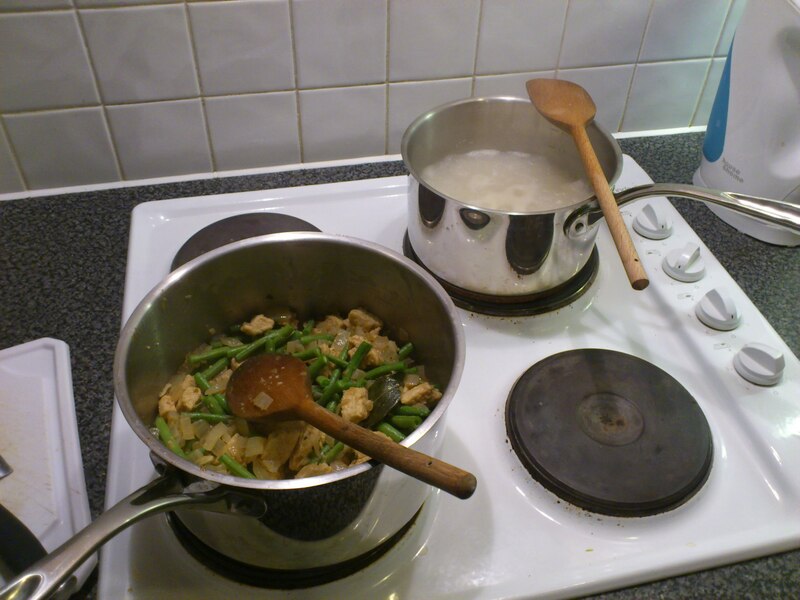 The last Curry we had was a wonderful Thai Green Curry cooked buy Hana, and as I write this she is cooking one up now! So what to cook this time? I moved slightly west of Thailand, to India. What I like most about a Thai Green Curry is the balance of Hot Chilli against flavourful spices and cooling herbs. Its still got the heat you know and expect from a Curry, but it’s not so hot that its overpowering. I think of its Indian cousin as being a good Korma. Again its got what I think is the perfect balance between hot, Garlic and Chilli, a wonderful blend of spices and cooling yoghurt. With a Korma you need a little cream (or in this case Creme Fraiche) to thicken the sauce but if you keep it to a minimum then its not going to be so much that its really bad for you. 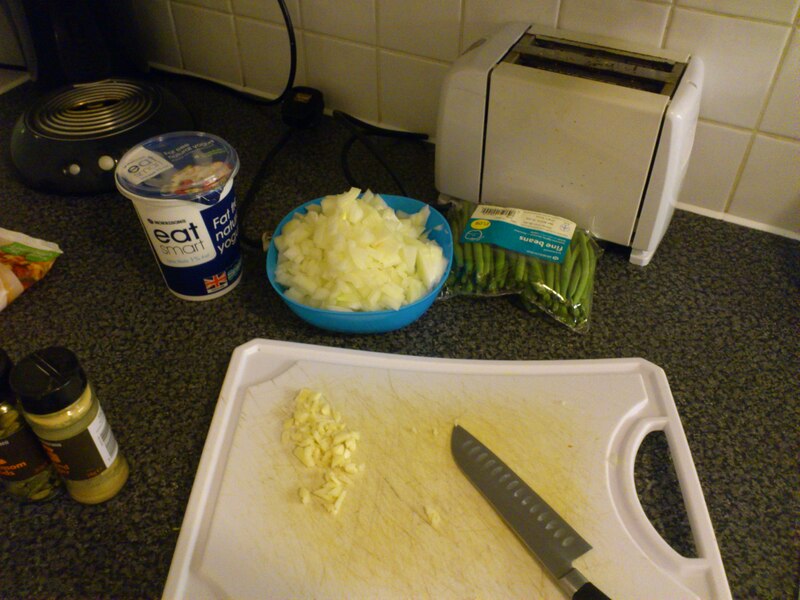 So here is my quick and easy week-night Curry. I used Quorn Chicken Style pieces but it would work equally well with Chicken, a Strong white Fish or just make it Veggie. Finely chop the Onions and Garlic. In a deep pan heat the Vegetable Oil with the Ginger and add the Onion and Garlic. Cook over a medium heat for 5 minutes. 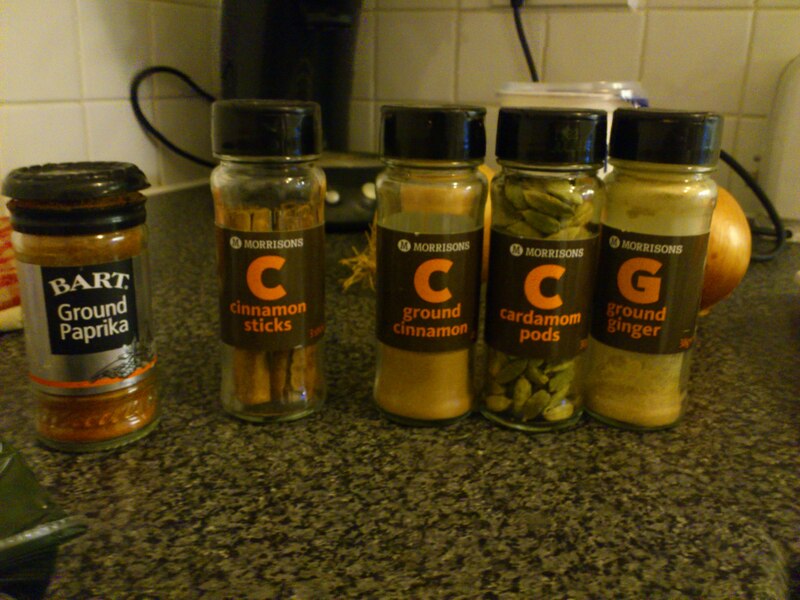 Add the Cardamom pods, Cumin, Ground Cinnamon, Paprika, Bay Leafs and Cinnamon Sticks. 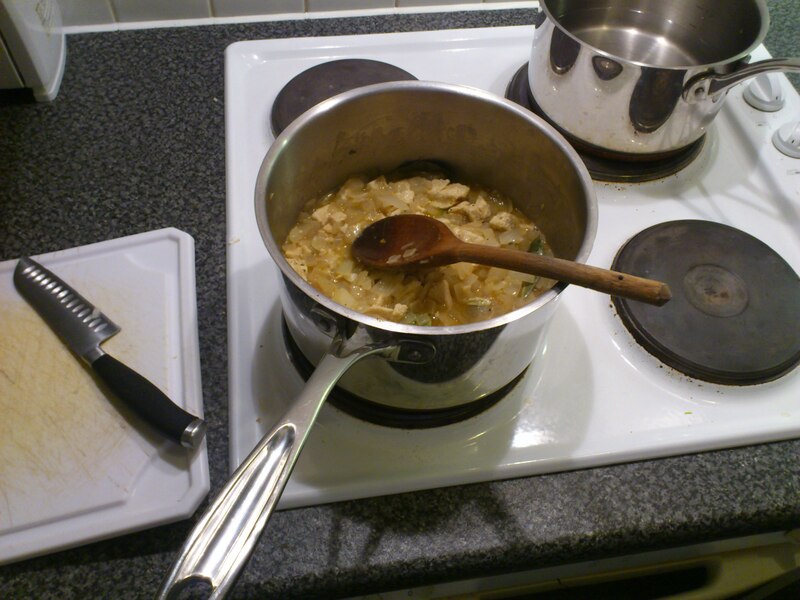 Stir through the Onions and Garlic. Add the Quorn pieces, now add about 200ml of water. Stir and cover and simmer for 15 minutes. Turn down to a low heat. Gently stir in the Creme Fraiche and Yoghurt. 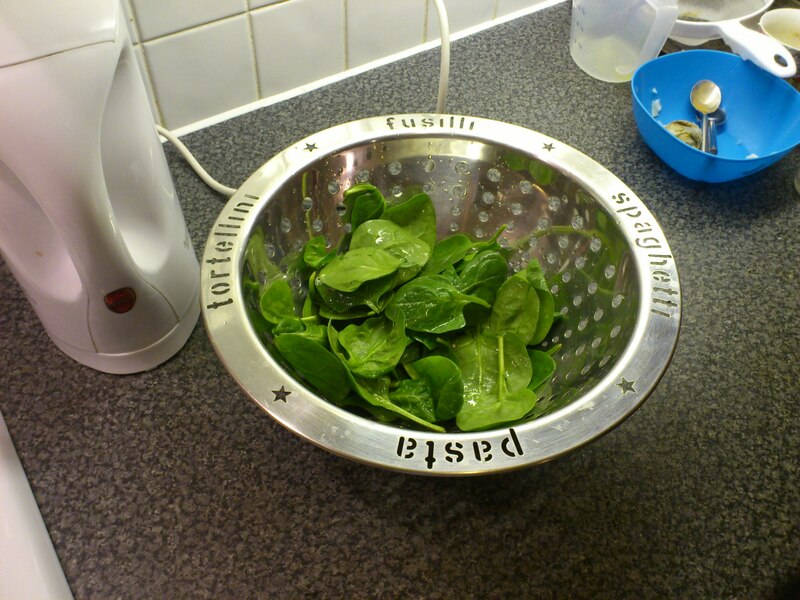 Stir through the Spinach and let it wilt into the mix. Gently warm through bringing everything together. Serve with Rice or Naan Bread. Click here to find more pictures on Flickr.